Political pressure on Chancellor Angela Merkel to sack Germany's domestic intelligence chief, Hans-Georg Maassen, will reach a climax on Tuesday. Ms Merkel is to meet her coalition partners to examine the spy boss's controversial response to recent far-right unrest in Chemnitz. Unnamed coalition sources quoted by the daily Die Welt say Ms Merkel has decided that Mr Maassen must go. He had expressed doubt that migrants had been hounded in Chemnitz. Why did Mr Maassen get into hot water? Far-right groups, including football hooligans, protested in the eastern German city on 26 August just hours after a German man had been fatally stabbed in a brawl with migrants. Later two male asylum-seekers - an Iraqi and a Syrian - were arrested and accused of the stabbing. Police are still looking for a third suspect. 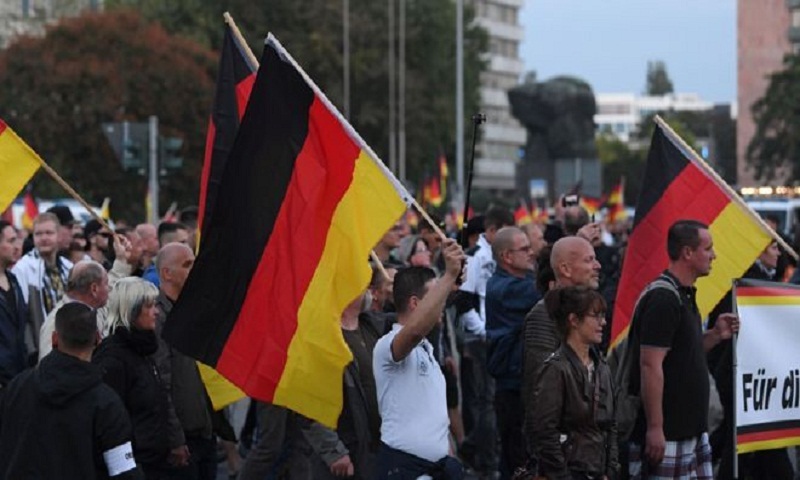 Several assaults on foreigners, or foreign-looking people, were reported in Chemnitz, and were described as racist "hunts". Images emerged showing demonstrators chasing people and flinging bottles and fireworks. But Mr Maassen said his Federal Office for Constitutional Protection (BfV) - Germany's equivalent of the UK's MI5 - had "no reliable information about such hunts taking place". He also questioned whether a video posted by "Antifa Zeckenbiss" - meaning "anti-fascist tick bite" - really showed, as claimed, a "hunt in Chemnitz" on 26 August. Mr Maassen said the video could have been disinformation; he added that he did not know who was behind Antifa Zeckenbiss. The BfV said it must investigate reports of the Chemnitz unrest further, because "there are always fake news and attempts at disinformation" on social media. German public broadcaster ARD said in a "fact-check" that Antifa Zeckenbiss is an anonymous Twitter account, active since February, posting anti-fascist messages and "there is nothing to indicate that it is a fake account". There were more far-right rallies in Chemnitz after 26 August, and smaller counter-demonstrations by leftists. How did it get so political? Mr Maassen's comments exacerbated tensions in Chancellor Merkel's coalition. She has frosty relations with Interior Minister Horst Seehofer, leader of the right-wing Bavarian CSU, who objects to her liberal migration policy and who has now defended Mr Maassen. Mrs Merkel lashed out in parliament against the Chemnitz extremists and said Germany must stop any "hunts" targeting foreign-looking people. Pictures "clearly show hatred and persecution of innocent people", she said. "There is no excuse or reason for hunting people down, using violence and Nazi slogans, showing hostility to people who look different, who have a Jewish restaurant, for attacks on police officers," she told the Bundestag (parliament). She is to discuss the Maassen controversy with Mr Seehofer and centre-left Social Democrat (SPD) leader Andrea Nahles on Tuesday. SPD general secretary Lars Klingbeil said: "It's absolutely clear to the SPD leadership that Maassen has to go. Merkel must take action." The Maassen controversy is thorny for other reasons too. The Chemnitz tensions are grist to the ideological mill of Alternative for Germany (AfD), the far-right party with 92 seats in the 709-seat Bundestag. It is the main opposition party and backs the far-right protests, arguing that violent asylum-seekers should be expelled from Germany. AfD is furious with Mrs Merkel for having let in more than a million migrants in 2015-2016. Mr Maassen reportedly advised AfD on how it could avoid being put under BfV surveillance - however he has denied doing that. His predecessor was forced to quit over BfV shortcomings in the notorious NSU neo-Nazi case. An NSU cell killed 10 people in a racially-motivated campaign in 2000-2007. The BfV and police were found to have neglected or ignored racism as a motive. So the Maassen affair fuels fears that Germany's main state security body may be soft on far-right extremism.